I'm curious about the history of your bus. Does it have a name? What year is it? How did you find it? I looked all over Hell & Creation for a bus locally that was in my price range. (Cheap). In November of 1994 I saw a 1978 hardtop bus in one of those free "auto traders" magazines, and thought, "Eh, give the guy a call". He was up in Toledo, about 2 hours away. So me and a buddy drove up to see the bus the first or second week of December. He told the owner, "Look... my buddy only has $2,500 on him (I had more!) and he really wants this bus. The Seller went for it. I went to bed (Um... passed out?) and slept late. I was in the jon on the throne when my boss from work called me at noon to say, "Happy New Years! BTW, the shop burned down last night." Have you had many old VWs or was this your first? My first experience. A guy I worked with 6 years ago, who owned 2 buses, turned me on to the Kelleys Island Campout in October, on Lake Erie, in Ohio. I backpacked over to the Island on the ferry boat, and camped on the beach. I had a GREAT time, and SWORE I would return the following year with a bus of my own. And I DID! I've been to every Kelleys campout ever since I got my bus. I busted my clutch cable in 2009, 7 miles from the ferry dock. Crap! My Brothers helped me put on my replacement cable in the rain in a puddle along side the road. An hour later we got onto the island and in to camp. News travels fast in our club (Leakoil) and when I arrived, the kids were saying to me, "Hey Uncle Howie! We heard you had a breakdown. Glad to see ya made it here!". I can't tell you how good that all felt! I was glad to be there! I'd rather miss Christmas than miss the Kelleys Island campout! What makes your bus unique? 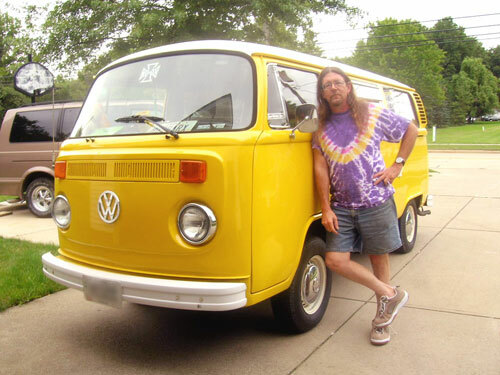 The original owner sold the bus to his son, who then sold it to his best friend, who was the guy that I bought it from. The interior is 99% Original. The upholstery is Stock. Some of the piping is pulling away from the front seats. I covered it all to preserve it it until I can get it re-done. The rear bed/seat area is in primo shape. Cabinets are good too. I replaced a lot of small bits, like handles and latches, and I've added a lot of "decor" ala curtains, stickers and decorator tidbits to the inside. It's a darn good bus, despite its cosmetic and minor mechanical flaws. I use it mostly for camping and don't consider it a "show" bus. The bus was white originally, but repainted to yellow and white by the previous owner. Come November (or about then) me and a few guys from the Club are going to pull the engine and do a Re-build. Gonna drop the gas tank for a re-line, and fix the gas filler tube that is cracked (And makes the bus smell like gas). It will be mostly Free Labor, but cost me in parts, beers and sandwiches as payment. Fair deal! If you could hop in the bus with the family and just take off tomorrow - which direction would you head and why? The whole family??? I thought the idea was to have FUN on the trip? LOL! SO many places I want to go... Florida to see my buddy, the Lake Erie Islands to chill, Athens, Ohio to visit my old friends, and to Texas, California & Washington state to go bus-hunting. 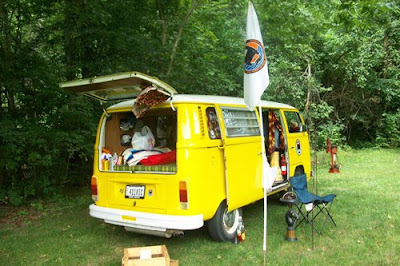 If you could buy any kind of VW bus - no question of price - what would your ultimate VW bus be? Easy one! Split window double cab. 2-tone light-over-dark gray metallic paint job. "Bagged" (hydraulics) suspension. Safari's front and back. Porsche engine with a Gene Berg shifter. (Hey, YOU said, "Price is no object"!) ;-) Oh, and it has to have one of those "Barefoot" gas pedals from JCWhitney. heheheh! why did the shop burn down? my dream bus would be a double slider split with sunroof, slammed, porsch motor, Orginal patina...inside will be a killer sound system and just some basic "fold down" seats...the kind you would find in a movie theater or stadium. that would be my street warrior. my current bus would still be my camping beast. The "Official" reason the firemen gave for the fire was, "Kids playing with matches next to the waste-paper containers outside the shop". But there are some folks who think it is was "Jewish Lightning". Awesome bus! Loved your story! In that first picture I was installing a new engine seal. 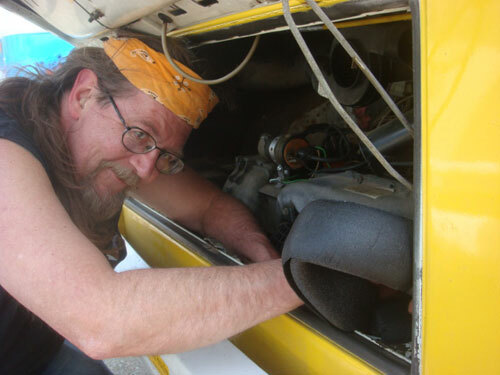 When I bought the bus the old seal was rotted out, so I stuffed the gaps with Pink Insulation, and duct taped over the top and bottom of it. A guy in our club who is an Engineer called it, "A darn fine job of Hillbilly Engineering". LOL! It actually took longer to peel the melted duct tape off than it did to re-install the new seal! ROTF! Vintage Tuesday! Bug in Switzerland. Perhaps today is the day we win? Off to Fall Finnon Fest today! 1954 Motorsports magazine - VW on the cover!